Everyone has seen the crazy "RICOLA!" commercials. It is enough to make you not want to try these cough drops. But don't let the commericals fool you into thinking that they aren't a great product. I am not that big a fan of the taste, it is sort of earthy with a hint of menthol, but it works extremely well. I find that they relieve sore throats and provide decently long lasting relief. They don't do as much for nasal congestion as some of the menthol brands do, but I find they provide longer lasting and more satisfying relief. Chest Congestion Relief These do not provide chest congestion, but they were not intended to. Relief of Aches & Pains These are great at providing relief of a dry, scratchy sore throat. Cough Suppression I find that these provide better cough supression than most other cough drops. They won't do much for a large cough attack, but they are good at keeping your throat moist and preventing cough in the first place. They work best at the first sign of a tickle. Ricola is hands down my go-to cough drop. I don't know what it is about it's special blend of herbs, but they truly provide relief for myself and for my family. I notice fewer coughs and some pain relief in my throat. They don't taste good enough to be candy, but the taste isn't so awful that the kids won't take them. It feels like a win. Congestion Relief I don't notice much by way of congestion relief. I definitely think of Ricola as a cough drop, not a decongestant. Chest Congestion Relief The soothing feeling that it leaves in my throat usually spreads down into my chest a bit. It may not loosen everything up, but it makes it feel better - and that's a huge bonus. Relief of Aches & Pains My throat always feels better with a Ricola in my mouth. I can talk better, I can swallow easier, and the relief is pleasant. No weird numbing like with other cough drops. Cough Suppression When something works, it works. I don't claim to know how or why - I just know that this blend of herbs makes me cough less every time I use them. I do not like the cough and throat drops with menthol and medicine. 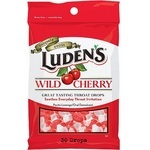 I love the taste of the Ludens Wild Cherry Drops but they don't offer much relief from very sore throats and cough. Ricola Original Natural Herb Cough Drops have natural herbs that do have healing properties without the harsh medicine taste. They are reasonably priced and widely available and come in different flavors and varieties. Congestion Relief These help me breathe better but they are not really meant to help with congestion. Relief of Aches & Pains These drops do a decent job of soothing my sore throats. I also give these to my kids because they do not like the strong medicine tasting drops. These still do not work as good as some of the medicated drops. However, if you can't tolerate the medicine taste these are an option that actually work to relieve sore throats and coughs. Cough Suppression These also help with coughs whether they are due to having a cold or throat irritations. I seldom get colds anymore but when I do and have that annoying sore throat and hacking cough, this is the first cough drop I reach for. I've tried dozens of brands over many years and this is the most effective and has a much better taste than those strong cough drops. I don't know what is actually used to make these but they taste good. They work and they don't make your tongue red or green or purple. Congestion Relief These do not relieve congestion. They help with a sore throat and ease the tickling in your throat which causes the cough to begin with. Chest Congestion Relief These do not contain menthol or any oils that I can tell which would help with chest or nasal congestion. Relief of Aches & Pains It's a cough drop and is not intended to relieve aches and pains. Cough Suppression This cough drop works great for soothing a sore scratchy throat and keeps the tickle down to a minimum. 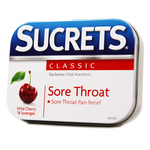 I prefer it becaue it isn't as sweet and has a much better taste than most cough drops. It's a more natural way to control your cough and sore throat. I have been using Riccola since that first came out a long time ago. I like the taste of them, as they have quite a selection of flavors to choose from. I like that they are herbal . More importantly, I like that they actually do what they claim to do when you have a cold which is provide relief from cold symptoms. i have pretty much tried every flavor they have and I can honestly say that the original flavor appeals to me more than the others do. Great product that I will always have on hand when I get a cold. Congestion Relief It doesn't really provide any relief for me if I have congestion. Chest Congestion Relief It does not provide any chest congestion relief for me. Relief of Aches & Pains Does not relieve body aches and pains for me. I don't think it is designed to do that. Cough Suppression I get props to this product because when I get a cold or I have allergy symptoms, I almost always get the nagging cough to go along with it ( I tend to refer to it as a tickle in my throat), that keeps me up at night because it just won't go away. I take a Riccola and it immediately eases the cough and eventually stops it so that I can at least go to sleep at night. I think I was a little girl when I first saw the Ricola commercial. My whole family always seemed like they had a package of those laying around. Now that I'm an adult, I stick to what I know works and Ricola cough drops are better than anything I've ever tried for anything from a hacking cough to a severe soar throat. I remember right after I had my kids, I got really sick. I had such a bad cough that I don't think I slept much. My husband came up with a pack of them and it was like a lifesaver. They have a sweet yet powerful feel that eases a bad cough like what I had. And when I have a bad sore throat, it's the only brand of cough drops I use. They are so great and work so quickly and last long so you don't have to eat them like candy. Definitely wouldn't switch for anything else. If you suffer from sore throats frequently, try these before anything else. It also clears up chest congestion and stops a runny nose. Very inexpensive. 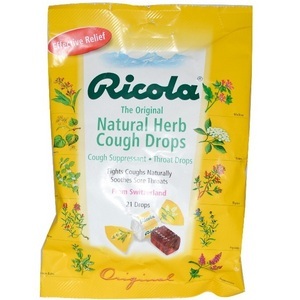 What I love most importantly about the Ricola cough drops is that it uses herbs to help soothe your throat. I feel like it is more natural to use a product that uses herbs that are good for me and therefore in the long run will better for my body. I was worried at first because it was made with herbs that it wouldn't taste very good because sometimes natural means gross! Surprisingly though, these cough drops taste wonderful! They help with my sore throat and suppress coughing fits very well.They are a great price, and easy to unwrap and use. They don't leave a weird after taste after using either. 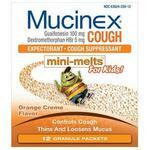 These tend to be my favorite cough drops and what I will purchase if available at the store. I also like the range of flavors your can purchase and the fact that there is a sugar free option of these cough drops as well. I really worry about the sugar in these products given my profession, so I like the option of taking sugar free cough drops. I highly recommend these! Out of all the cough drops I have ever used, the Ricola Original Natural Herb Cough Drops are the best tasting ones I've had yet! They're light and not too sweet, and don't taste like medicine at all. Sometimes it's hard not to just use them like candy. They're probably the cough drops that we purchase and use the most for sore throats, coughs, and colds. They also last fairly long, which is good, cause it's easy to go through that bag pretty quick! For an herbal cough drop, they work pretty well. They're soothing and your sore throat and/or cough will feel better afterwards. It doesn't do much for congestion, but then again it doesn't even say that it does, so I wonder why they even have that as a rating option! Price-wise, they're pretty affordable. Yeah, the Walgreens- or CVS-branded cough drops are probably cheaper, but not by much. And the Ricola cough drops are going to taste so much better! Natural Way to Ease Cough and Cold! I absolutely love these cough drops. I have used quite a variety of different cough drops in my day, and while those other brands may have been effective, often times I found them extremely overpowering and too strong for my liking. 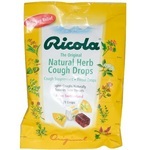 As soon as I tried Ricola Original Natural Herb Cough Drops, I was hooked. They are natural cough drops - made up of herbs rather than a bunch of artificial ingredients and chemicals - and they really do a wonderful job of soothing a sore throat and quieting a cough. I am completely sold on these and will never buy another brand. They have just enough of that menthol flavor to provide a cooling effect on the throat, without being way too strong that it burns. Congestion Relief It does a pretty good job. These aren't going to cure a terrible chest cold, but they do provide minor relief. Cough Suppression They have just enough menthol flavor to calm a cough, without being too strong. When I'm sick, sometimes too strong of a flavor can make me feel worse. These are mild, yet flavorful, and really do a very good job of quieting a cough while being natural. I love them!